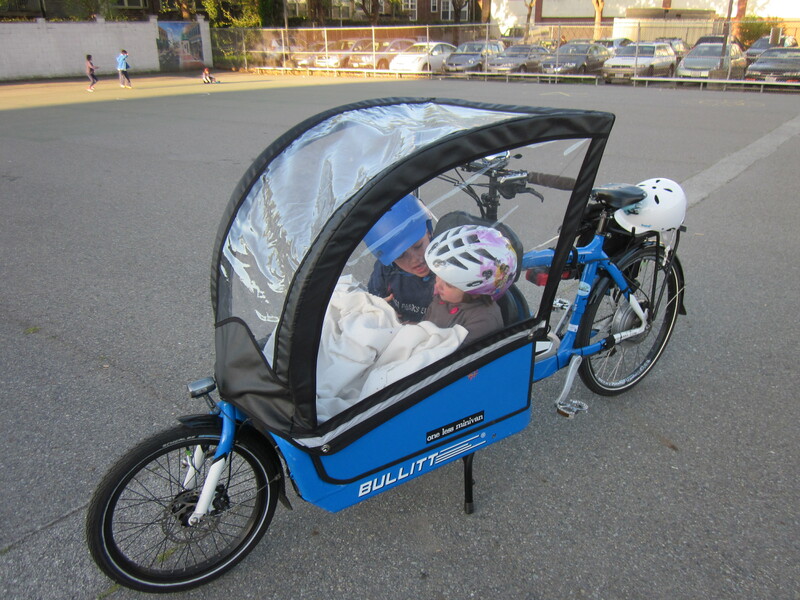 People keep asking, so here’s proof: you can fit 2 kids side by side in a Bullitt under the canopy. They are four and seven and were discussing Antarctica. This is a big weekend in family biking: in addition to Sunday Streets, the San Francisco Bicycle Coalition is holding a Playground to Playground Ride from Duboce Park to Golden Gate Park on Saturday (4/13, 10:30am). I think this is supposed to be kind of a sub rosa Kidical Mass (things that sound like Critical Mass have a mixed reputation among many in the city). I’ve been lobbying our kids to come on this ride as well but they’ve been balking, probably because there are no donuts involved. But adults who also prefer their rides to involve food might want to check out the simultaneous Western Lands Dumpling Tour (also 4/13, 10:30am), which I would totally do if I were riding solo this weekend, but that never happens. Oh well. Maybe we’ll do our own dumpling not-tour at the local hole in the wall. Or maybe not, at least not until I break myself of the habit of checking restaurants’ health department scores. The most exciting news for me this week was spotting another Bullitt bike set up for kid-hauling at our son’s after-school program. Which: !!!! 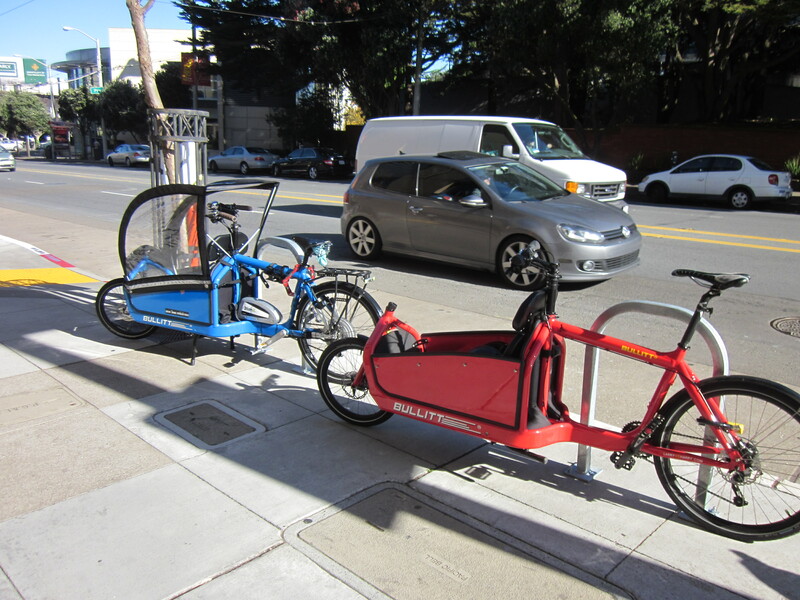 The security guards were as excited as I was when I rolled up in a matching bike to the brand-new cargo bike-sized racks that the internet gave us. Thanks again, internet! I don’t know whose bike this is, but between that and the Clockwork Orange kid-hauler my sister keeps spotting downtown, and the two families I have now actually communicated with who have Bullitts, our ranks are growing. That’s without even counting the guy I spotted on the Panhandle hauling his dog in a Milk, and the pink Bullitt I’ve seen parked around the Mission that always seems to be loaded with furniture. And we are outclassed again. Last but not least, Matt reminded me why we often ride the Panhandle, still, instead of taking Page: because the bikes on the Panhandle are awesome. 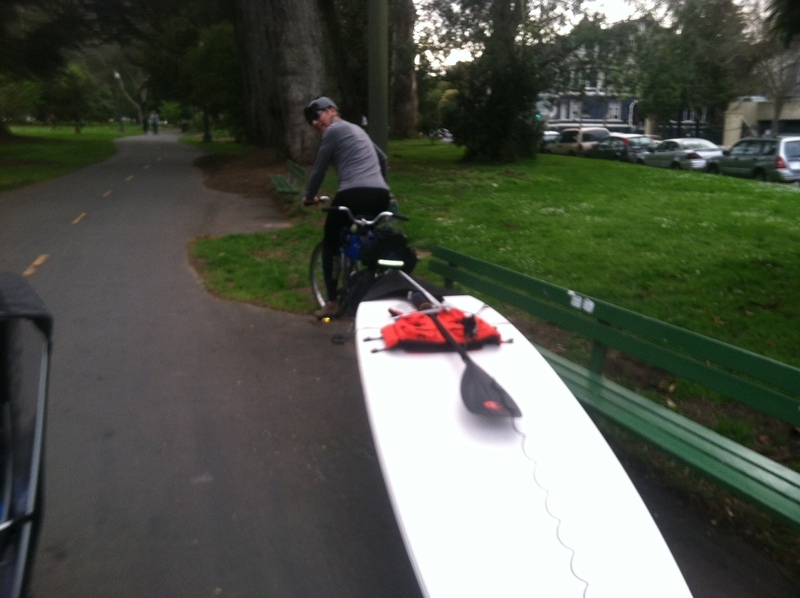 Why not haul your boat with your bike? Why not indeed? There’s at least one other red e-Bullitt in the city. Ooh, I like Playground to Playground Ride. I’m going to have to copy that! Sounds like a perfect small-kids-on-small-bikes idea. Have fun Sunday Streeting this weekend!